Paracetamol cures Suzuki Engine.- Invader 22 - Sailing Lena. Thought you might like to see the problem I had with the Suzuki outboard. 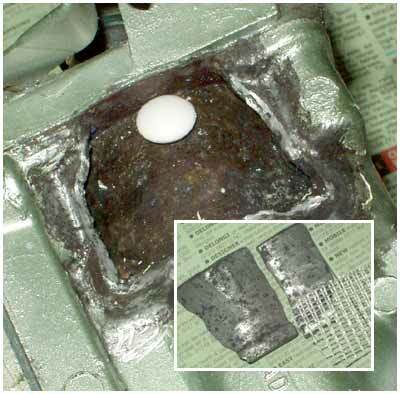 My first repair was with a 'chemical metal type' compound, one of the epoxy paste thingies. They are very hard - but the problem with this type of repair is really the 'expansion factor' . There is no real pressure on the water jacket, the impellor simply pumps water up to the jacket, it flows around the head and out again down the exhaust leg. With the heat it just split off, one side - leaking a fair bit of water. If too much of the flow pours out of this break - it would probably effect the amount of water flow around the other side of the jacket and head. A small leakage is not too much a problem really. For the second attempt I decided on a very lateral approach. The ' Evostick Nail & Seal' - ( form a tip on-line from a boating forum ) is some very tenacious stuff. I used some to fix some oak slats on the cockpit floor, instead of Sika - a subsequent attempt to remove them actually tore the gelcoat off of, I should add 'very sound', grp, in places. ! I figured that, rather than making an absolute bond, edge to edge - I could roughen and degrease the entire area, then build up a thick, flexible, layer all over the old plate pieces, reinforced with some nylon mesh. The repair would be very difficult without these original pieces. ENGINE REPAIRED WITH PARACETOMOL TABLET ! I needed something to support the two plates, until the Polyurethane went off, but couldn't get it out again, so it had to dissolve in water - the paracetamol was just the right thickness - it amused me somewhat. BTW - having now run it for a couple of trips to the mooring - it seems fine, still quite intact.